The magic ring (or magic adjustable ring) is a great way to start projects that are crocheted in the round. It’s particularly helpful for making top down hats without a little “air hole” at the top. It also helps keep the stuffing inside of your amigurumi projects. Kristine Mullen from Ambassador Crochet shares her magic ring tutorial here. How to Make a Crochet Magic Ring Tutorial. © Ambassador Crochet and used with permission. If you’re ready to try that magic circle on a project, here are some of my free crochet patterns that start with a magic ring. Most crocheters are not in love with decreases. While they can be necessary for your project, sometimes they just look terrible. Rebekcah Ferger from Rebeckah’s Treasures shares her tips for making invisible decreases in this video tutorial. If you’re ready to try out your invisible decreases, try my free amigurumi pattern for the Gift Pocket Bear. It uses the single crochet version of an invisible decrease. If you’ve been crocheting circles in the round, you may have noticed that when you consistently increase in the same spot, you end up with a hexagon rather than a circle. Jess Mason from Screen to Stitch shares her method for crocheting a smooth circle in this video tutorial. Try out staggered increases in my free amigurumi pattern for the Chubby Sheep. Many crocheters work exclusively from patterns because they are worried about “doing it wrong.” Patrice Walker from Yarn Over, Pull Through shares 3 ways freeform crochet boosted her confidence. A freeform crochet project. © Yarn Over, Pull Through and used with permission. I did my own exploration of freeform crochet back in 2012 and I completely agree with Patrice. I took a wonderful freeform crochet and knitting class with Margaret Hubert. If you’d like to start your own freeform journey, Myra Wood offers both Freeform Crochet and Modern Irish Freeform Crochet classes on Craftsy. Hmmm, invisibility seems to be a theme here! But those finishing details can really make your crochet projects look fabulous. Kristine from Ambassador Crochet shares a tutorial for fastening off your projects invisibly. How to Invisibly Fasten Off Your Crochet. © Ambassador Crochet and used with permission. We continue the finishing theme with a tutorial from Maria Bittner at Pattern Paradise for lining a crochet bag with fabric. Another great way to make your crochet bag more sturdy is to felt it. You can find my felting tutorial here, and try lining or felting my free Tunisian crochet pattern for the Basketweave Mini Messenger Bag. I’ll admit it, I was as (or more) resistent to blocking as most crocheters. But once I actually tried it, I found that it makes my finished projects look a lot better than they did before. You can learn the blocking basics in this post. Spray blocking my Pineapples for Everyone Shawl. 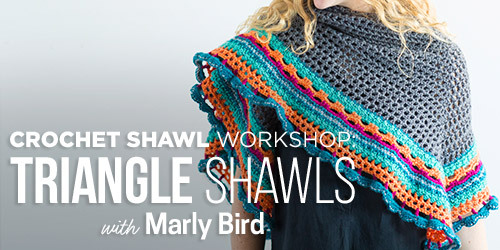 If you’d like to try out blocking, here are several free crochet shawl patterns that will just bloom after blocking. Pia Thadani from Stitches ‘N’ Scraps shared that learning foundation stitches and the standing double crochet was very important. Jennifer Dickerson at Fiber Flux has a great series of video tutorials on foundation stitches in her Crochet Stitch Library playlist. Kim Guzman shared that learning to knit was helped her to improve her Tunisian crochet skills. Joanita Theron from Creative Crochet Workshop has been sharing a great series of guest posts on knitting basics at American Crochet called A Knitting Journey. What crochet skills and techniques have helped you out the most? Love this post because all of these tips really do polish your project and are worth learning.. Having them all in one place for reference is wonderful! To say which have helped me most is hard as each project may require one skill more than another. I think learning foundational stitches and standing stitches really does make the going easier and allows crisp definition, the magic ring/circle is paramount to working on rounds as it allows a smoother stitch join and the ability to close the hole formed at the start, and the invisible join really does not only end the work in a visually pleasing way, but also makes joining a next round more cleanly. Two tips I would add is learning to join a new color and weaving in the ends/tails. I tried to find the blog that posted this technique, but instead of weaving the yarn tails in at the end, you incorporate the ends into the same color stitches. I love using this method when I can as weaving in yarn tails is sometimes a downer (for me) , especially after completing a large project! Thanks for these great tips! Thanks for sharing these great tips, Darlene! Weaving in ends can be a downer for me, too, especially on big projects. Love these tips! I’m going to look into the free form crochet! Freeform is a lot of fun, Angela!